In his latest Diplomatic Dispatch, CBS News State Department Reporter Charles Wolfson charts out President Bush's escape routes from a diplomatic fire over a promised U.N. vote on Iraq. The Bush administration is in a serious diplomatic jam and many questions are being asked about how it got there and how it gets out. There will be plenty of time to look at what led to the current diplomatic and political crisis – and that is what we should call the current situation – but the most important question now is how the situation gets resolved. One U.N. diplomat said the only question left to decide is whether to call for a vote in the security council and, as President Bush said, see where each country stands; or, alternatively, pull the current resolution before the council and not take a vote, an implicit recognition that the votes are not there. This is what the discussions in the Azores on Sunday will be focused on, when Mr. Bush meets with Britain's Prime Minister Tony Blair and Spain's Prime Minister Jose Maria Aznar. There may be a diplomatic solution still within reach, but if there is, no one has yet offered the right compromise. 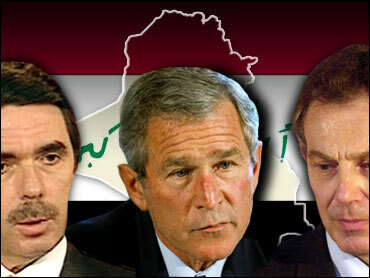 Between the two obvious choices, pulling the resolution from the Security Council calendar and walking away from the U.N. process may offer the Bush administration the least pain and the most flexibility as it moves, almost certainly, to implementation of the military campaign to disarm Iraq and remove Saddam Hussein from power. Going to war with a so-called coalition of the willing still will bring criticism from many quarters for disregarding the opinions of the majority of members on the council, but criticism is going to come no matter what. At least, if this course of action is selected, you swallow the bitter pill of defeat in private and move on. Another downside to this option is that Mr. Bush will have to spend a lot of time explaining why he changed his mind when he said last week, "No matter what the whip count is, we're calling for the vote." The other option is to insist on holding people's feet to the fire and making them cast a vote in support of backing up Resolution 1441, making each country publicly declare its position. This puts more pressure on the six undecided members of the council – Chile, Mexico, Angola, Guinea, Cameroon, and Pakistan – and the question then becomes: What is to be gained by forcing them to publicly vote against the United States? None of the undecided countries wants to be seen going against American policy, but they all have their own political considerations and see things from the other side of the coin. If the resolution is destined for defeat because the French have said they would use their veto, why go through the exercise of being pressured to support Washington in what will be a losing cause at the end of the day? A war against Iraq does not have popular support in these countries and if Mr. Bush sticks to his rhetoric, it just rubs salt into the wound. They either vote no and risk offending the Bush administration or they vote yes and risk political payback at home. It's called lose-lose. The only other possible outcome of the summit in the Azores would be yet another compromise formula that would be offered as "Saddam's last, last, last, we really mean it this time, last chance." No one wants to rule such a possibility out completely, and finding a formula to unify the Security Council – as was done with 1441 after almost eight weeks of negotiations – is a desirable goal. However, most of the betting is that it's simply too late for that now. Paris has overplayed its opposition to such an extent that it's doubtful Washington and London can find common ground with it at this point. Whatever decision is reached Sunday, politics will have trumped diplomacy and world leaders from Santiago to Yaounde, from Moscow to Conakry, from Paris to Luanda and from Islamabad to Mexico City will have to pick up the pieces of their damaged relationships. In Washington, the first order of business will be removing French cutlery from the backs of Mr. Bush and Secretary of State Colin Powell. But the healing process will not begin until after the war in Iraq is over.